Tell me if you can relate? You go to the eye doctor. You browse their eyewear. You fall in love with a pair of frames that look amazing on you. You ask for the price. BOOM! It's $350! And the excuse for the price is always the same thing: "Well, they're DESIGNER." Honestly, most of the time, I've never even heard of the designer that makes the glasses. The brand name means nothing to me. Maybe it's because I don't wear my glasses 24/7 as I'm mostly in contacts. I'm a part time eyeglasses wearer but I still value the look and feel of prescription eyewear on my face. I just don't believe in paying a crazy amount of money for 1 pair of glasses that I might get bored of within a few months. If you can relate, then you're going to appreciate my discovery. Firmoo is an online optical store that I was lucky enough to find a the right time when I was in need of new glasses. Their deals are INCREDIBLE! I decided to test them out by uploading my prescription and browsing their frames (it might take you a while because they have so many). I found 2 pairs that I ended up purchasing as part of the BUY 1 GET 1 FREE deal. The frames cost $39.99 and the lenses were an additional $10. I spent $50 total for 2 pairs! I couldn't believe it and that's why I made the video attached to this blog post. I wanted to share Firmoo.com with you in case you found yourself running into my same problem. On Firmoo's website, every frame is under $39 so the truth is you might spend even less than $50. It only begins to add up (and not by much) when you upgrade your lenses with add-ons like anti-reflection, blue light blocking, anti-radiation, tinting and perhaps a thinner style lens (this last one I highly recommend). 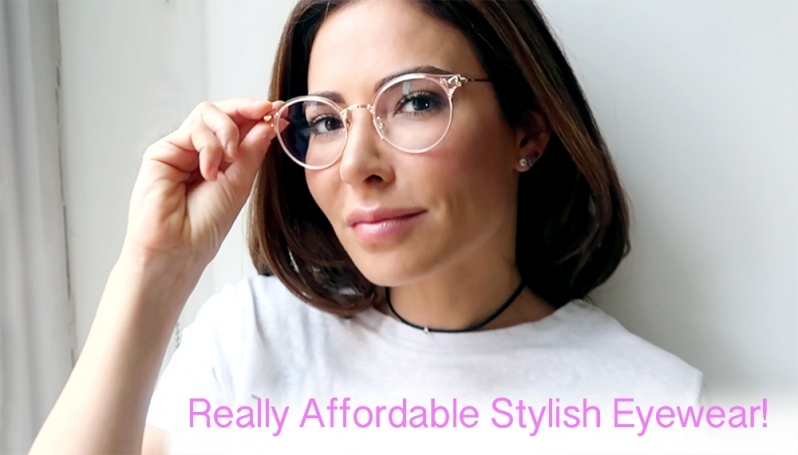 From my experience, you can expect to receive your glasses in about 2 weeks and what you get it are frames that are lightweight and fitted to your face. My advice is to take your time when filling out all the information that the online order requires. Make sure to measure the parts of your face accurately because you want the glasses that come in the mail to be perfect. I was really happy that I went this route because I spent $50 instead of $350, I got 2 pairs that express my personal style and now I would totally shop on their site again. In fact, I'm eye-ing this style, which is super hipster. What do you think? Let me know if you end up trying Firmoo.com or if you have tips to share when it comes to purchasing new prescription eyewear.